Increasing offshore oil & gas exploration activity, growth in mining and power infrastructure have increased the demand for electrical houses globally. This has been further amplified with the increasing demand for E-Houses arising from the renewable energy sector. Global increase in the rail infrastructure, with dedicated freight corridors being constructed around the world, would also fuel the E-House business globally. The growth of E-House market is primarily driven from investments in oil & gas sector and power sector. According to 6Wresearch, Global E-House Market Volume is projected to grow at a CAGR of 8.5% during 2017-23. Development of smart grids and establishment of nuclear and renewable energy power plants would fuel the market for E-House in the forecast period. The offshore oil & gas sector accounted for majority of the revenue share in the global E-House market. Over the next six years, the mining, rail infrastructure & transportation segments are forecast to showcase strong growth. 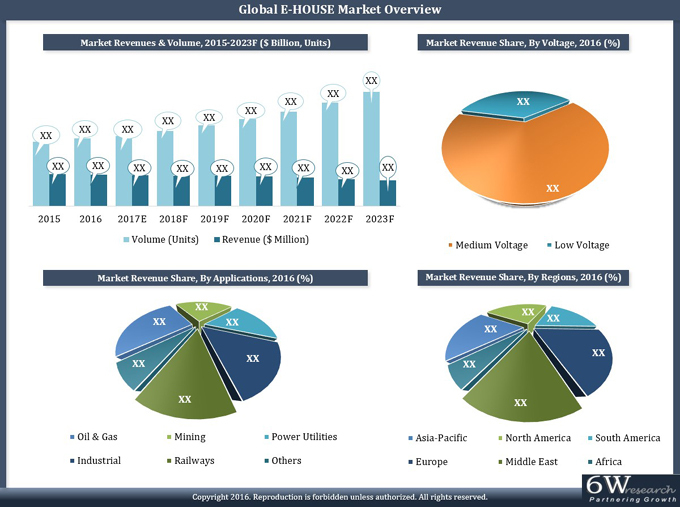 Global E-House market is dominated by gas insulated medium voltage segment in 2016.